The Accidental Locavore has been really busy so this is a re-run of a trio of fun recipes. Which is your favorite? I’ve been playing around with a couple of really easy summer recipes. One of them does require use of your oven, but just do it in the morning before it gets hot out. And two of them are great over ice cream, not that you need an excuse! This is from The Vermont Farm Table Cookbook, but I did it the way I usually do flavored vinegars and heated the vinegar before pouring it over the cilantro. It’s a great light vinegar for Asian or Mexican inspired salads etc. Heat the cider vinegar to a simmer. 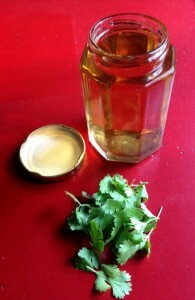 Put the cilantro in a jar or small bowl, crushing it slightly as you put it in. Pour the vinegar over the cilantro. Cover and let sit for 2-3 days. Strain through a sieve into a clean jar. My husband recently came home with a massive amount of strawberries. Since I didn’t want them to go to waste, I roasted them. 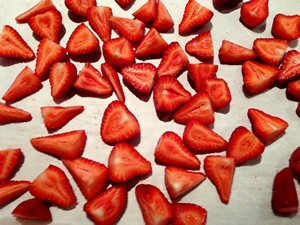 It’s a wonderful topping for yogurt or ice cream, or could be used for an interesting version of strawberry shortcake. I’m sure cherries, or any other berries, even peaches would be good done this way. Preheat the oven to 350°. Line a baking sheet with parchment paper. In a large bowl, add the strawberries and the sugar. Toss gently to combine. Place the berries, cut side up on the baking sheet. Roast them for 20 minutes until soft and juicy. Remove them from the oven and put them in a medium bowl to cool. They will become juicier as they cool. A few years ago, my mother started buying this and serving it over ice cream. It quickly became a guilty pleasure. This was just on the Food 52 website and I had to try it. My biggest problem with the store-bought variety was the amount of junk that was in it. This has 2 ingredients and might be your best excuse for buying a food scale (but not a regular scale!). If you don’t have one it’s 3 parts chocolate to 2 parts coconut oil. Combine the chocolate and coconut in a microwave-safe container (I used a 2-cup glass measuring cup) and microwave on high for 30 seconds. 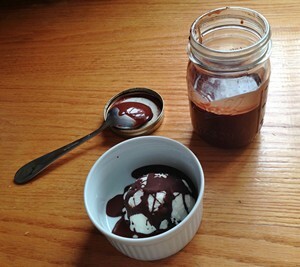 Stir and microwave in 30-second intervals until the chocolate is melted – it will be pretty quick. Stir until well combined. Pour over your favorite ice cream, wait 1 minute for it to harden. Serve and enjoy!